For those of you that are not aware, Adam Firestone, one of the founders of the Firestone Walker Brewing Company, is part of the Firestone family, the same people that founded the Firestone Tire and Rubber Company in 1900. In addition to Craft Beer, members of the Firestone family are also involved in winemaking and distilling (the Firestone clan sound like my kind of people!). While I can’t say much about the quality of the Firestone family’s wine and whisky endeavors, my experiences with their Craft Beers have yet to disappoint me, so when I saw that The Foodery had their Pivo Hoppy Pilsner in stock during a recent lunchtime beer run, I picked up a bottle for a review. Appearance: Crystal clear with a pale, golden yellow color. Oodles of translucent, fast rising bubbles floating to the surface. Thin bead of off white foam and a wee bit of clingy lacing. Aroma: Very fresh and floral smelling. Subtle notes of honey and citrus with an almost fresh herb scent lingering in the background. I’m thinking chives with a hint of celery. Taste: Smooth and silky carbonation with a light mouthfeel. A touch of honey sweetness at the onset with a mild hop bitterness immediately following. As you approach the finish, a good bit of those mellow herbal notes come through. Very crisp and clean aftertaste. 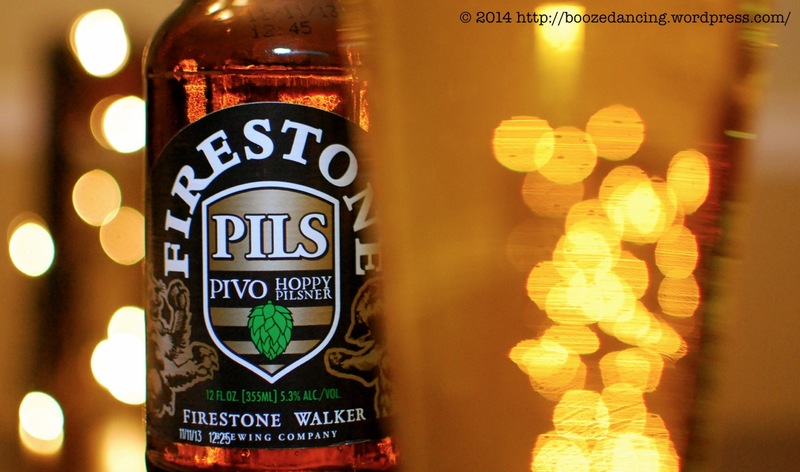 Pivo Pils is crisp, clean, and refreshing without being boring. While I could have easily finished off this beer in under a minute, I took my time and drank it over the course of an hour. In addition to being delicious from start to finish, Pivo Pils was also super tasty once it warmed up to room temperature (try doing that with a glass of standard issue Bud/Miller/Coors). I highly recommend giving it a try. I’ll be back…. *no Austian spiked and gel-addled hairy accent intended…. I literally have to get up, go to my car, make it go, and drive to the local craft beer store to try and get a bottle of this (MIND YOU I STILL HAVE YET TO POUR AND DRINK A SINGLE CRAFT BEER AT HOME ALL YEAR! – though I did have a few in NC last weekend – just to stay in practice). Was Your Quest a successful one? Actually, I was gonna include him, but didn’t have enough time to make it sound good. I actually watched the first couple seasons of The Bachelor. More importantly, he was a year ahead of me in law. Being the dolt that I am (was)…am…I didn’t spend much time around him so here I am typing this instead of helping him brew his amazing beer. Coulda, shoulda, woulda. We’ve all got those moments. But drinking and typing about his great beer ain’t so bad. So so true! Well said Ma’am! That’s ok. I graduated with one of the guys behind the DiBruno empire. I should be selling cheeses and cured meats as well as arranging food and booze pairing events. Instead I’m a slovenly bean counter. Such is life I suppose. I know I should be reading the review, but I can’t take my eyes of the photo. Love the peek-a-boo the bottle is doing! Nice job! Ha! Thanks Ed! Tis a tasty beer for sure. Would love to hear your take on it.